Atomic Reach integrates with MailChimp and now gives you access to all your MailChimp marketing emails. Step 1. Begin by navigating to Create module and selecting emails. Step 2. Select the Drafts button at the top right and select the email you would like to optimize. Step 3. Once you have loaded your email draft, click the Assess button at the bottom right. Step 4. To begin optimizing your emails based on the feedback you received in the email Recommendations dashboard, using the menu along the bottom. Make sure to only turn on one measure at a time. Step 5. Once you are finished editing your email, click the Save button at the top right. Step 6. Once you receive the Success notice, you can copy and paste your email into MailChimp. 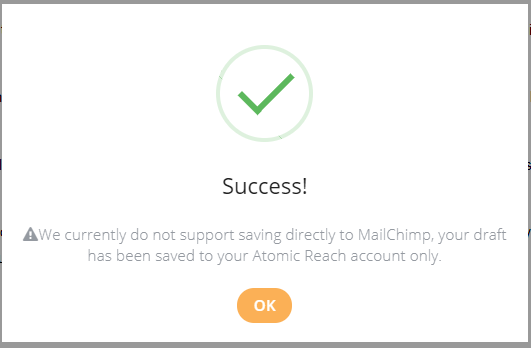 Your marketing emails are automatically brought into Atomic Reach when you integrate with MailChimp. Atomic Reach cannot create emails for you from our platform because there are additional settings you must select when creating emails in MailChimp. You must create the email in MailChimp and access it via the Drafts button in Create. We cannot push emails back into MailChimp. You must save your email as a draft and then copy and paste your email into your MailChimp account.